Quick, name the hottest trend in education today. 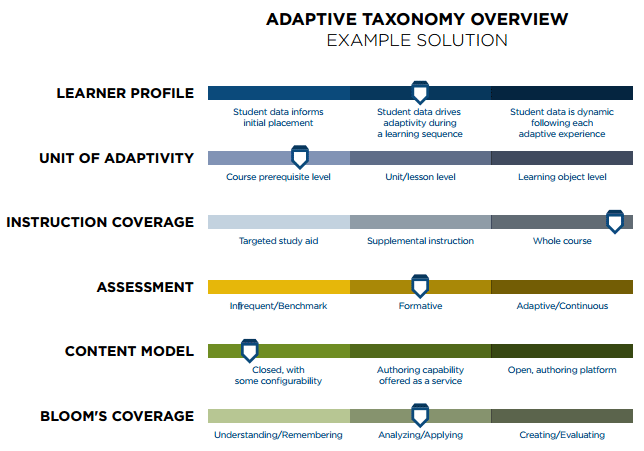 Adaptive learning? Coaching? Tailored curriculum? And therein lies the problem. If we don’t have a common understanding of this concept, it will never succeed at scale, no matter how hot it is today. To help our field move further, faster, the CEOs of Fidelis and Smarter Sparrow teamed up to create a Taxonomy of Personalized Education. Why aren’t students ready for college? Why do so many students dropout? Why is it so hard to get a good job after graduation? What makes the best students succeed? In other words, we know a lot about why students fail (lack of preparation, financial difficulties, etc.) but wouldn’t it be interesting to understand more about why others succeed? Because if we know about what drives success, we can potentially help at-risk students tap into some of these same strategies. looking for best practices & tips for coaching? Join our webinar series. To this end, we reviewed over two dozen articles on student persistence (i.e., what makes students succeed) and found three traits that appeared time-and-again. We call them the 3 Ps. Want more information about how LRM drives the 3 Ps? Drop us a line. The degree is also completely severed from the credit-hour standard… Brandman estimates the typical student will be able to complete the degree in 30 months. At $5,400 in tuition and fees per year, that means some students should be able to earn the bachelor’s degree for $10,000. Fidelis Education’s learning relationship management system (LRM) can work for institutions with competency-based degrees. Gunnar Counselman, the company’s founder and CEO, said one institution is using the system this way, and another 20 plan to create competency-based badges to supplement their core curriculums. If you’re interested in learning more about how LRM can drive competency-based programming, just drop us a line!